Panasonic USA projection solutions are designed for the immersive entertainment experience, not just in sports but any live entertainment venue or permanent facility. Via high-res images, digital signage and new flag mapping, projectors display visually enhanced imagery designed to augment events, sales and corporate partnerships fans are utterly delirious about. Their proprietary projection mapping tech and laser projectors feature vivid colors, a long lifespan and superior image quality that can be integrated into a live sport event, theme parks and retail partners, communities and museums, as well as a wide assortment of other venues and special needs. Panasonic technologies and engineering support was appreciated at the 2017 season seven Game of Thrones (GoT) premier party on the Walt Disney Concert Hall the night before the Emmy’s, at Chicago’s Millennium Park and at the Rio 2016 Olympics. It can also be found at the Disney World of Pandora, casinos (MGM Grand Kabuki Event and Bellagio Fountain), along with additional integrations at the Kennedy Center and Country Music Hall of Fame. The Sports Techie community blog takes a look at these case uses of Panasonic’s top-of the line AV equipment solutions and resulting fan engagement improvements. 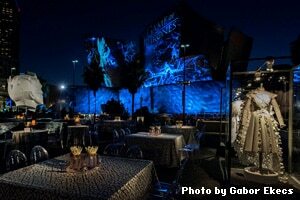 PANASONIC, WORLDSTAGE AND BARTKRESA STUDIO PARTNER TO PROVIDE SPECTACULAR PROJECTION TECHNOLOGY FOR “GAME OF THRONES” PREMIERE PARTY. Projection mapping technologies and engineering support provided by Panasonic was selected for a HBO (Home Box Office) Game of Thrones premier party by WorldStage and BARTKRESA Studio as the center piece for this world-class live event which included cast members. New Panasonic PT-RZ31KU laser phosphor projectors that function day or night were installed after meeting production specs, industry leading technical standards, as well as providing the highest quality necessary to highlight GoT’s seventh season’s projection experiences via light, story, and design. The GoT premier party highlights included: a flying dragon engulfing the facade in flames, the faces of the Night King, the show’s stars wandering on an icy tundra and the blooms from the Weirwood Tree billowed across the facade, thawing the ice. The use of rotating projection GoT looks on structure’s facade created a sense of inclusion into the show. To augment the premiers setting, the after-party held on the roof level of Classic Parking across the street looked down on the hall where Master Projection Designer Bart Kresa created projection mappings of the upper sections of the facility with riveting scenes and wondrous imagery taken from HBO’s top series. WorldStage provided Kresa with Panasonic laser projectors and video engineering support for the eye-catching imagery. Installation, projector setup and alignment by WorldStage was done quickly and efficiently the day before the event. Crown Fountain in Chicago’s Millennium Park got a Panasonic upgrade together with Threshold Acoustics, a Chicago-based AV consulting firm. The new design and install of the innovative solution resulted in a LED framework upgrade that showcased the faces and aquatic features with twice the brightness and multiple hues as before. Light occupancy sensors highlighted the art saving 25% in energy costs while being easier to maintain via light, removable panels. Rio 2016 Olympic Games – Sharing the Passion. Rio 2016 was the culmination of 25 years as the Official Audio Video Partner of the Olympics during the first Olympic Games in South America located in Brazil. Rio de Janerio was the home to the opening ceremonies for fans that came from all regions of the world. As the “Official Ceremony Partner” Panasonic delivered 110 projectors to Maracanã Stadium, with added broadcasting equipment and systems, support and imaging solutions expertise to ensure the visual system design, installation, operations, and maintenance were best-in-class at each venue. Panasonic projectors, broadcasting cameras and equipment, and monitors were used throughout the Rio venues, in addition to the use of LED large screen display systems at 35 venues/facilities totaling 72 screens equaling to 1,886 meters. Sugarloaf Mountain in Rio was the headquarters for the “Stadium of Wonders” corporate pavilion set up by Panasonic to highlight their 25-year partnership and the rich history of the event business arrangement. Info about the Torch Relay was provided to fans via enhanced immersive technologies such as transparent screen displays. 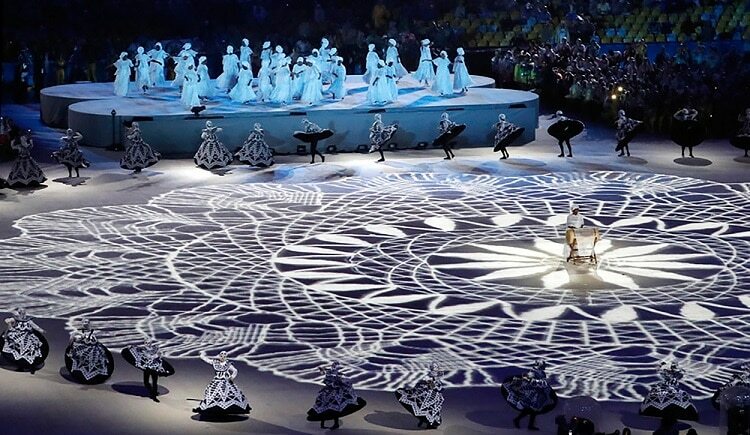 The Opening Ceremonies were filmed with Panasonic’s Varicam 35 4K cinema camera then shown on a 250-inch LED screen also in 4K quality. The “Sharing the Passion” slogan will also be used during the upcoming PyeongChang 2018 Winter Olympics in South Korea and the Tokyo 2022 Summer Games. Choreographed light displays and branded messaging over high-definition Panasonic PT-RZ31KU laser phosphor projector units at the Bellagio’s spectacular water fountains in Las Vegas spanning over 1,000 feet across at the Kabuki Spectacle give visitors the sense of a different universe. The results of the live action Kabuki, Panasonic projection mapping and the glimpse into nature’s supremacy was a unique fan experience that enabled the display to impact visitors, guests and families alike with a unique lifetime memory in a city full of captivating visuals. Panasonic Projection Solutions at Game of Thrones Premier Party, Millennium Park, Rio Olympics, and More – SportsTechie blog. Sports Techie, I’m a GoT’s fan having watched all the episodes. Learning how Panasonic’s projection mapping technology impacted the fan experiences at the Premier Party, Millennium Park , Rio and Kabucki made me want to fly on a virtual dragon to the PyeongChang 2018 Olympics in Korea and see what Panasonic has in store for next year’s winter games Opening Ceremony and beyond. Will your venue, museum, show or exhibit be the next Panasonic-driven entertainment projection event of the ages? Panasonic projection mapping solutions may be the exact right fit for your business custom needs.